On Wednesday evening, April 22, Mars and Mercury will be about a degree apart. There are two interesting but challenging events in the night sky this week: a close conjunction of the two smallest planets, and a chance to observe at least one asteroid close to the moon. Tonight (April 22), about half an hour after sunset, there is a chance to observe the two smallest planets, Mercury and Mars, shining close to each other. Weather permitting, the planets will appear about a degree from each other, about one-tenth the width of your closed fist held out at arm's length. This evening, Mercury will be joined by Mars, which is heading behind the sun towards conjunction on June 14. Because Mars is on the far side of the sun, it is now more than two magnitudes fainter than Mercury. Look for it in binoculars just to the left of Mercury, and slightly closer to the horizon. In a telescope you should be able to see both planets in the same low-power field, though both disks will be extremely small. Mercury is 5.7 arc seconds in diameter and Mars only 3.8 arc seconds. There are 60 arc seconds in an arc minute, 60 arc minutes in a degree, and 360 degrees in a circle. This will probably be your last chance to see Mars before it reappears in the morning sky in late August. On Saturday night, April 25 (actually Sunday morning), the setting Moon will pass just below the bright asteroid Juno, while a number of fainter asteroids are clustered around. The other event this week is a close pass by the moon just south of the asteroid Juno, which occurs late on Saturday night (April 25) or rather, early Sunday morning (April 26) just as the first quarter moon is setting. Like all the asteroids, Juno will appear no different than a 9th magnitude star, so you will need optical aid and a detailed chart to see it in the night sky. It's always interesting with a planetarium program like Starry Night to see what other asteroids are visible on a given night. I've turned on the labels for the brighter asteroids to give you an idea of how many asteroids are visible around the moon this Sunday morning (April 26). A planetarium program will tell you exactly how bright each one is, and let you print out detailed finder charts for each. I particularly like the strange and exotic names which have been given to asteroids. All the ones in the chart are relatively old discoveries, dating from the 19th century, and all but one have the names of minor figures in mythology. Bamberga is the only asteroid in the chart not named for a mythological figure; it was named after the city of Bamberg in Germany. It is also the last asteroid discovered (in 1892) which can be seen in binoculars; every asteroid discovered since can be seen only in telescopes. Nowadays, asteroids get named after many people and things, including even a few rock stars. Juno is the only one of the asteroids in the chart visible in binoculars. All the rest are 11th magnitude or fainter. Except for Juno and Bamberga, which are both about 145 miles (235 km.) in diameter, the rest are much smaller in size, ranging from Nemesis, which is 117 miles (188 km.) in diameter, to tiny Lucia, only 34 miles (55 km.) across. 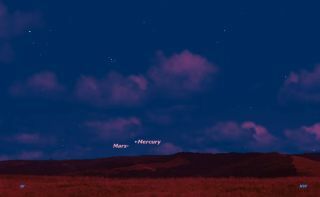 Editor's note: If you see Mercury and Mars together in the night sky let us know. Send us photos and comments for a possible story or gallery at: spacephotos@space.com.